Previously on Tiger & Bunny, the titular super-heroic duo and their peers gave their all to defeat the arch-villain Jake Martinez, leaving the ever-intense junior partner Barnaby Brooks Jr. in a quandary – if, as he declared before his untimely death, Jake didn't murder Barnaby's parents years earlier as was believed, who did? The matter's set aside for now, though, as the start of this volume sees Kotetsu 'Wild Tiger' Kaburagi and Barnaby, ten months later, riding high as Sternbild's most popular heroes, leading to some discomfort among those eclipsed by their success. It's the turn of teenage siren Blue Rose and former top hero Sky High, and their mixed reactions to Tiger and Barnaby's success, to take centre stage in the first episodes of this volume. While these guest-star episodes, as before, rely too much on the presence of the main duo for comfort, the writing seems more assured than before: Blue Rose's unwelcome discovery of her crush on the much older and oblivious Kotetsu, which could have been the occasion for some uncomfortably crass anime-esque comedy, is handled with relative restraint. The naïve, humble Sky High, questioning his worth as a hero, unexpectedly finds romance with an enigmatic stranger, in a bittersweet episode that subtly recalls director Keiichi Satō's previous work The Big O and provides some of the most heartfelt moments to date. It's a shame more time couldn't be found in the series' run to focus on the secondary characters, as they bubble with potential and could easily have rewarded more attention. That said, the duo of Tiger and Bunny are the centre of the show, and Kotetsu, the down-to-earth, unreliable goof, returns to the spotlight as the recurring incidents of his powers going haywire can no longer be ignored. With Kotetsu facing the possibility of having to give up superheroics for good – a prospect underscored by some grim revelations about two supporting characters – he takes the opportunity for a visit to his picturesque faux-Japanese hometown and a typically clumsy attempt at getting closer to his young daughter, who remains ignorant of her old man's double life and far from impressed at his doting-daddy act. The melodramatic reconciliation of sorts that follows is slightly underpowered, yet fitting as it demonstrates Kotetsu's unerring inability to get things properly resolved. With the return to Sternbild, Barnaby's own investigation into the Jake mystery takes a nasty turn, pointing the way to the final volume with a deft cliffhanger. As ever, Tiger & Bunny rewards repeated viewing with its use of background characters and worldbuilding, although the plotting and dialogue occasionally comes too close to comic-book predictability. Kotetsu is a superbly drawn protagonist, however, so sympathetic even in his moments of objectionable foolishness that the callow Barnaby seems two-dimensional in comparison; the supporting characters' ample charm just makes me wish better ensemble writing was on display. The production and voice acting are as strong as ever, though, and with Kazé's bonus-heavy release building up into a gorgeous collection, it's a must if you enjoyed the first two volumes. 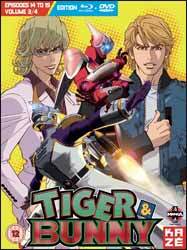 Despite its faults, Tiger & Bunny is terrific fun.